Recently I received an email asking me if I wanted to review the book Mastering Redmine, first of all I was honoured and would like to thank Kenny Dias for the opportunity. I have been a longtime user of Redmine and have helped install and support it on several occasions, I have even written plugins to help other things talk to Redmine in the past, I guess you could call me a Redmine Power User, which I think makes me qualified to write this review. For this review I was reading the kindle version of Mastering Redmine, which is available on Amazon or on Packt Publishing. Anyway, without anymore preamble, here is my review! I have to say I wish I had read Mastering Redmine about a year ago when I was setting up my last install of Redmine - the things that I had no idea you could do or the things that I knew were possible but didn't think were worth the effort are numerous to say the least, this book is a real treasure trove of information. You really get the sense that this has been written by someone with a strong development background, which for me is great but might leave non-developers confused with some of the terminology. This however is addressed at the start of the book saying that the examples will assume Redmine is being used for Software development and to be honest I think this is going to be the use case for Redmine 80%+ of the time. 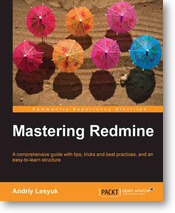 I found that the author really holds your hand through the basics, if you where coming to Redmine for the first time this would be really useful, and are easy to skip past or use as a reference if you are already familiar with the basics of Redmine. One real takeaway is that I have learned a lot about how you can integrate version control into Redmine, I had only really used it as a code browser before and was aware you could do some basic stuff but not to the degree as has been discussed here. I thought it was interesting that they have decided to include a "Helping Redmine" section so early in the book - I agree with the fundamental idea of helping out projects like Redmine and agree with all of the suggestions ranging from if you were a technical to non-technical user, but I feel this should be somewhere near the back of the book instead of right in your face quiet early on. I have always found the installation instructions that you find online for Redmine to be a little sparse and I think this book makes a far better attempt at explaining the Redmine installation process to the user. Although I must say as a disclaimer that I didn't attempt to follow this instructions, but certainly they looked about right. On occasion I found some of the grammar and sentence structure a little off, it wasn't that there was anything wrong with what was written per se but some sentences did take me to read over them a couple of times. This is also a tiny bit of errata but as an ATOM reader the book suggests Google Reader, this of course isn't really recommended anymore as it is closing down. An issue I have had before with Redmine, and something that is highlighted in this book is that the plugin system isn't exactly ideal and I have to say after reading this book there are so many plugins that I wish I had known about before. The practical examples for sorting out a workflow really helped me get my head around a process that I was never really 100% sure on before. All in all I thought this was an enjoyable and informative book, certainly it has been the best thing I have read on the subject of Redmine and would highly recommend you buy it if you are using Redmine day to day or are considering it. Buy Mastering Redmine here or here. Discuss this review on the Redmine Forums. My review on Amazon for this book.